I'm super excited to show off my latest pattern release, the Bagatelle Cowl, part of the Boardwalk Collection from Kettle Yarn Co., which is launching tomorrow, 13 July. Photo copyright 2015 Juju Vail for Kettle Yarn Co. I'll have a lot more to say about this pattern on (revised date) 4 August, when I'll talk about the design in detail for the blog tour for the collection, but suffice to say that Linda's new yarn base, Islington DK, was a dream to work with, and I loved every second of working with it. Don't miss the launch of the collection and the blog tour on Linda's blog tomorrow. 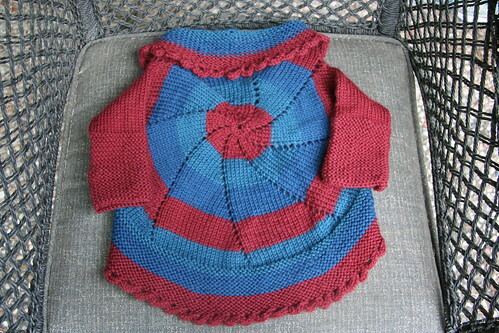 And you can see all of the patterns in the collection on Ravelry. Comments: Very fast to knit, I love knitting lace in worsted weight yarn. It ended up a bit smaller then I expected, about 44 inches in diameter, so if I make it again, I'll probably keep feather and fanning for quite a bit longer to get a bigger blanket. And maybe block it out a bit more severely. As it is, it will be a good lap blanket for someone for C#$#&^*. (Note: friends and family can place bids in the comments as to who gets this one). Pattern: Clapotis. If you don't know where to find this, I'm sorry, you'll just have to be out of luck because I am not linking to it. And really, it's time to crawl out from under that nice rock you've got there. Start/finish: Started as a reward for finishing the Halloween costumes 11/1. Finished the knitting on 11/3 - completely addictive! Blocked and dried, 11/11/07. Comments/mods: Since I only had just over 200 yds of yarn, of course I couldn't do a full sized Clapotis. And I don't really need a full sized one - it just doesn't get that cold in Houston. So with the help of numerous other folks who have already done mini versions, I decided to do one set of increase rows and then weigh the start of the scarf (17 g). I then knit straight sections until I had 20 g of yarn remaining and did the decrease rows. I probably could have knit one more straight section, but the scarf starts and ends on the same part of the color repeat, which I like for symmetry's sake. I read the very informative post here and decided to twist my stitches on both the knit and purl sides, and to twist them so that the front leg pointed into the stockinette sections. I really like how it looks once the stitches are dropped - there's no wonkiness along the edges of the stockinette sections at all. 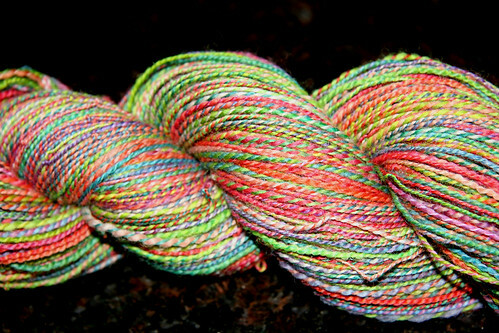 This yarn is my first chain plied yarn, and as I've already said, I'm a big fan of the three ply. It's wonderfully soft, and I'm anxiously waiting for it to be cold enough to need this beauty in the mornings. I can't wait to show it off! I'm mostly recovered from my expedition over the weekend with the girls to North Carolina*, but it's amazing how exhausting vacation can be! We left on Thursday, sneaking out of IAH between feeder bands from Tropical Storm Erin, and made it safely to Richmond, VA without an further mishap. Despite having to sit on the plane for an hour at the gate and then for almost three hours in the air, the kids were fabulous. Having a bulkhead seat helped tremendously, but it was still a long time to be stuck in one place, particularly for Devil. We met Nana in Richmond, threw the kids (neither of whom slept on the plane) into the car, and headed south. They were both asleep inside of ten minutes, and we had a very peaceful trip down to the lake. Things were very calm until Friday morning, when my cousin arrived with her two kids (7 and 3) and then later in the day, my two aunts arrived with another cousin and 2 more kids in tow (4 and 10 months). Devil was so enthralled by all the excitement that she basically forgot to eat. The rest of the weekend was a blur of playing in the lake, going for rides in the big motorboat (which Devil very proudly got to drive), and the ingestion of copious amounts of junk food. 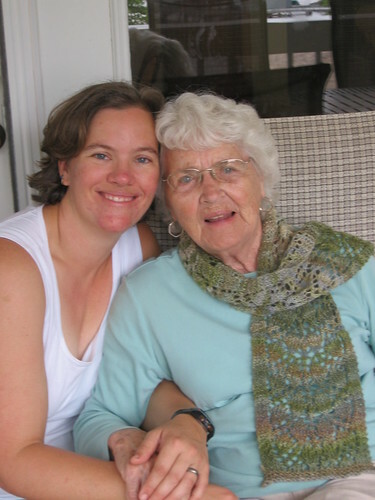 On Saturday night we had Granny's birthday party, and I gave her the Branching Out scarf I've been working on. I'm not much in to making scarves, they get real boring real fast, but something about this one was different. Maybe it was the lace pattern, or the excitement of working with yarn I spun myself, but I really enjoyed making this scarf. I was originally planning on keeping it for myself, but decided that Granny would love it. And she did. Although she made sure to tell me to take it back when she goes. She loved the colors (which are perfect for her), and was very impressed by the fact that I'd not only knit it, but also spun the yarn. That's the kind of appreciation for handknitted gifts you like to see! 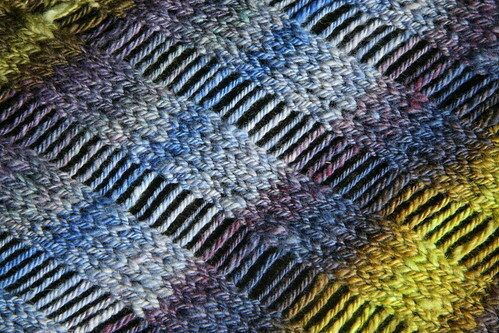 , but it was approximately worsted weight (varied between 11-13 wpi in three different skeins). I started off with two skeins, one thinner then the other. I weighed both skeins and the thinner one was also half the weight of the other. I wanted to avoided pooling and abrupt changes in the color sequences as well as minimizing any variability in the gauge due to thicker versus thinner spinning, so I used both balls at the same time, working 4 rows from the heavy/thicker ball and 2 rows from the lighter/thinner ball. I carried the non-working yarn up along the side, catching it up in the middle of the 4 row stretches so it didn't dangle off the edge. This worked out pretty well, but when I ran out of the thicker ball of yarn, the scarf wasn't quite long enough, so I had to spin up some more. Thankfully I had some fiber left! Gauge: Hunh? Who cares, it's lace...about 7 inches wide and on the short side for a scarf. Trip back on Sunday was uneventful except for Boo showing disturbing signs of wanting to be _that_ baby. You know the one, who screams non-stop for the entire flight and will not be mollified. Thankfully we were right next to the engines at the very back of the plane, and she eventually conked out. Note: I'll be on a brief hiatus for the next couple of weeks - we're heading off to the UK tomorrow for a wedding and some time out looking at fossils on the Jurassic Coast. But back after Labor Day, and I've got a review of a bunch of different types of spinning fibers in the works for you. * except for the lovely case of pinkeye I've picked up from my oldest child, for which I spent two hours at the doctor's office this morning trying to get some antibiotics. Thanks Dev! I've got several finished items to show you today. First up is the final Lantern Moon skein. It took me what felt like forever to ply this stuff up. At least four evenings of solid 2 hr plying sessions. But I'm pretty happy with the finished product - I like the colors alot more then I thought I would when I started off.
) was to prep all the top at once, predrafting each section and then winding up two big balls of fiber to spin. That meant that once I started spinning, I could just keep going without needed to stop and prep more fiber. 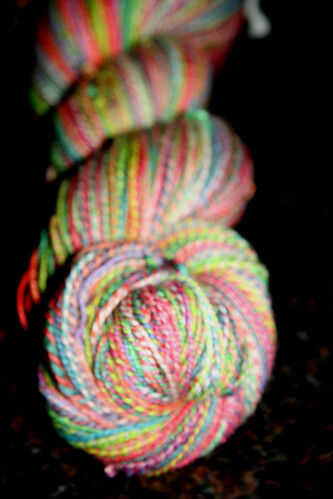 The best part of the spinning was watching how the colors changed. This was also the worst part of the plying - I seperated the top by color repeats and was hoping to get them to line up in the finished yarn. Mmmm...not so much. 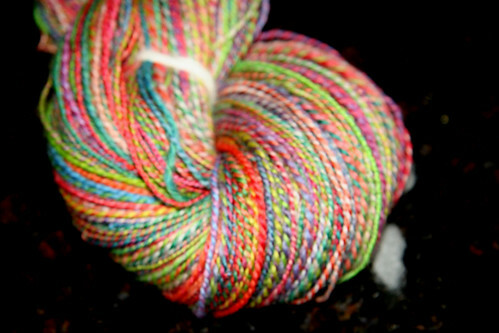 But this stuff is still very pretty, and will make good Silly Socks* for Devil. This is my first fiber-to-FO project, and I'm really pleased with how it turned out. And the process of knitting with yarn I had made myself was really a special one. I also found the variability of the yarn worked well with the lace pattern and kept things interesting. I'm not going to put a moratorium on all mill-spun yarn for future projects, especially for something with a lot of stockinette, but I'm liking the handspun stuff alot. Here's a final, unfortunately framed shot of the Lantern Moon for you. Probably no Fiber Friday this week since the girls and I will be in NC for Granny's birthday (cross your fingers for me for the plane ride tomorrow afternoon! ), but I'll be back next week, hopefully with more stuff cleared off the needles. I'm getting some fall sweater startitis around here! * Every Friday Devil's classroom does something different, for example wearing pajamas to school. Last week Friday was Silly Sock day. I found out about this on Wednesday at 5:15 pm, and spent more time then I care to admit trying to calculate how much sleep I would have to give up in order to knit her some Silly Socks by 7:00 am Friday morning. Needless to say, I came to my senses and ended up putting embroidery floss bows all over a pair of socks she already had. She was quite taken with the idea of silly socks, however, so there's another project to add to the list.